Uh, Why Is This Satellite Image Of The U.S. Glowing Red? This satellite image of an eerie red glow lingering over the midwestern and eastern US may look alarming, but it actually comes bearing good news. So what's behind the red glow? It's photosynthetic activity over four years from 2007-2011. 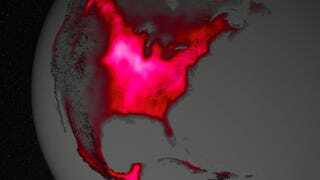 And using that data, scientists at NASA say that they've found that the midwestern U.S. is the hottest spot for photosynthetic activity on Earth. As plants carry out photosynthesis, their chlorophyll also generates a slow amount of fluorescence. It may be invisible to us here on Earth, but by processing meteorological satellite images, we can get a look at that fluorescent glow and its intensity — and it could be the best measure of agricultural productivity that we've generated yet, says NASA. Besides being a marker of existing productivity, researchers also hope to use the models to make predictions about upcoming crop seasons.